I found this cookbook in a junk shop and was taken with its stylized illustrations. It had clearly been well used: repaired many times and even re-bound by hand. Later an Estonian friend explained it was THE cookbook: the only cookbook of Estonian dishes one could find during the Soviet era. The irony is that many of the luscious fruits and vegetables depicted were completely unobtainable. 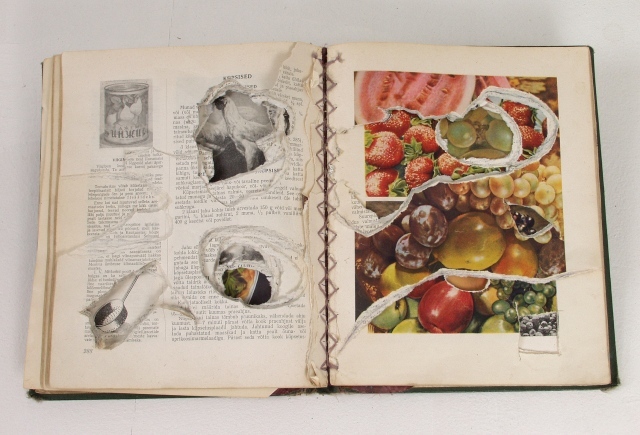 I altered the cookbook, ripping holes and creating view-throughs that highlighted both the beauty and the irony. The book was published the year of Stalin's death: hence the title (The fact that the delicacies depicted WERE available for Stalin was not lost on Estonian audiences). This work is now in the collection of the Estonian National Art Museum.